There are few things in this world more simple than a cup of Easy Mac — that beautiful, blue bowl that requires three minutes in the microwave and basically no effort on your part (if only all relationships could be so chill). But while mac and cheese — even the instant kind — can stand by itself, these Easy Mac hacks by Spoon University will have you looking at that little packet of orange cheese powder in a completely new light. Some of these hacks are so easy, you'll wonder why you didn't think of them first. 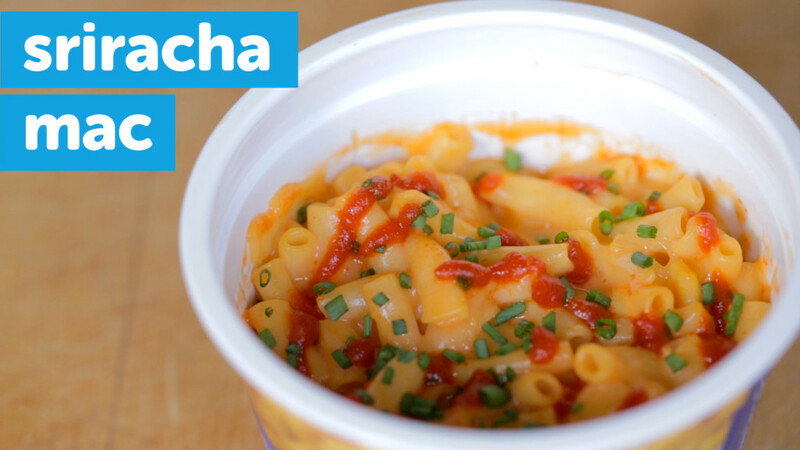 (Sriracha in your mac and cheese? So basic, yet so brilliant.) Others are just plain genius... like ingredient swaps that turn your Easy Mac into a delicious bowl of savory noodles similar to what you'd find on the menu at your favorite Thai restaurant. At the end of the day, you can't go wrong with macaroni and cheese no matter how you dress it up. And if you're still into eating it plain, that's fine too. Just know that when it comes to Easy Mac, you have options. So many delicious, amazing, wonderful options. The humble Easy Mac cup is a staple of college dorm cuisine. But sometimes that neon orange cheese just isn’t enough by itself. 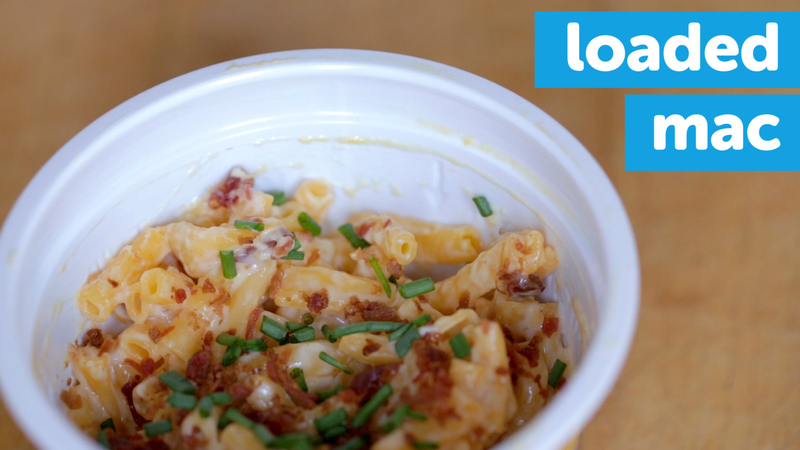 Take your microwave mac and cheese to the next level with these easy mac hacks. Directions:1. Remove the cheese packet and fill the Easy Mac cup with water to the line.2. Microwave the cup for 3 minutes and 30 seconds.3. Add the cheese packet and stir.4. Add Sriracha and stir. 5. Sprinkle chives on top. Directions:1. Remove the cheese packet and fill the Easy Mac cup with water to the line.2. Microwave the cup for 3 minutes and 30 seconds.3. Add the cheese packet and stir.4. Add sour cream and mix. 5. Sprinkle bacon bits on top and mix. 6. Sprinkle chives on top. Directions:1. Remove the cheese packet and fill the Easy Mac cup with water to the line.2. Microwave the cup for 3 minutes and 30 seconds.3. Add the cheese packet and stir.4. Add the three additional cheeses and stir in. 5. Microwave the cup for 45 more seconds. 6. Admire your beautiful, melty cheese. Directions:1. 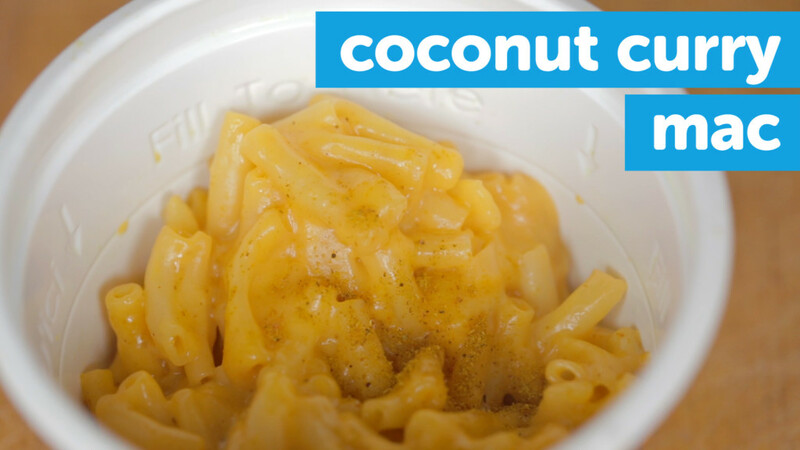 Remove the cheese packet and fill the Easy Mac cup with coconut milk to the line. 2. Microwave the cup for 3 minutes and 30 seconds.3. Add the cheese packet and stir.4. Add curry powder and mix in. 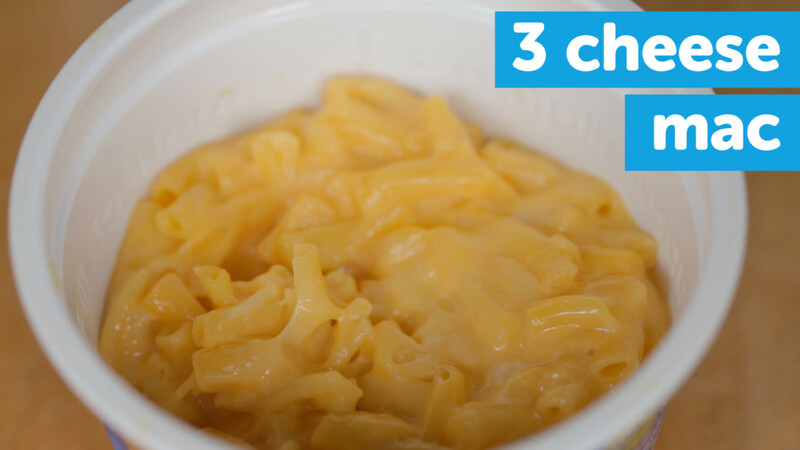 For four more awesome Easy Mac Hacks, click here. This article was originally written by Grant Sorbo for Spoon University - Rochester. Thanks to these articles for the inspiration.